North Korean officials told the Finnish public broadcaster that they haven't forgotten the over 30 million euros in debt they owe government and private businesses in Finland for transactions that date back to the 1970s. 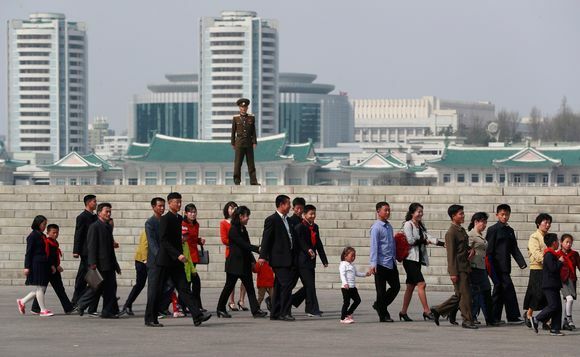 Foreign ministry officials in Pyongyang recently assured Yle reporters that a solution can still be found. North Korea is back in the front-page news, thanks to a series of failed missile tests and US President Donald Trump's pokes at supreme leader Kim Jong-un's hornet's nest. Finland's public broadcaster Yle was granted a rare interview with foreign ministry staff in the country's capital. Back in the 1970s, North Korea ordered paper machines and other assorted equipment from Finland that it never paid for. The total bill climbed to over 26 million euros owed to the Finnish state, and another six million that was never paid to private Finnish businesses. Officials in Pyongyang haven't forgotten this debt. "We hope you've taken into account the special circumstances of our country," North Korea's Foreign Ministry official Pak Yun Sik told Yle, speaking in Korean for the interview, despite earlier revealing a good command of English. "Not only in the 1970s, but also in the 80s and 90s, we lived through really hard times," he said. He didn't need to go into detail, because most people are aware of how North Korea's centrally-planned economy skidded to a halt after the 70s, and went into freefall once the Soviet Union broke up. After large-scale famine in the 1990s, the country still struggles with food production, for example. Pak, who is the North Korean government's highest official in charge of Northern European relations, told Yle that the economy in North Korea is looking up, so there still may be hope for Finland's IOU. "If both sides worked together, I'm sure we could find a solution to the problem in the future," he said. According to state financial statements, Finland has long since reduced the book value of North Korea's debt to zero, signifying no hope of repayment. Sweden has the same problem: one thousand Volvo passenger cars were sold to North Korea in the 1970s, a deal for which it never received payment. Trade between Finland and North Korea has dwindled to practically nothing in the 2000s. Finnish Customs reports that just 1,500 euros of goods were brought from Finland to North Korea last year, with imports to Finland accounting for just over 6,000 euros. In 2013 Finland sold 8.5 million euros in port cranes to North Korean harbours and industrial halls, but the rest of the years in this last decade account for just six-figure sums. Dental equipment has been the main export, in addition to the cranes. Several countries and international bodies have imposed sanctions against North Korea since its first nuclear test in 2006. The European Union enacted an embargo on arms, materiel, metals and minerals to stop development of weapons of mass destruction. Pak Yun Sik tells Yle that the nuclear deterrent is necessary for maintaining peace. "It is important to emphasize that the North Korean nuclear deterrent is a fundamental means of preventing war on the Korean peninsula," he said. Finland apparently stands among the countries that disagree with this statement, as it last renewed its sanctions against North Korea at the beginning of the month.